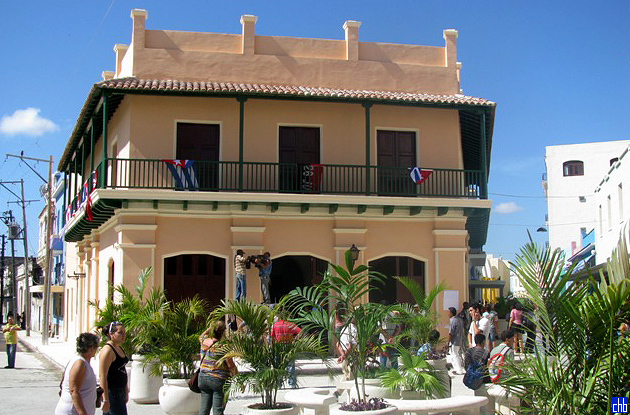 The charming boutique Hotel Camino de Hierro is excellently located, in Camaguey's historic colonial centre, that is declared a World Heritage Site by UNESCO. The 18th Century hotel stands on the Plaza del Gallo, formerly the Plaza de La Soledad, at the entrance to the main commercial streets Maceo, Republica & Ignacio Agramonte, & faces an ancient & impressive church, the Iglesia de La Soledad. The Hotel's name "Camino de Hierro", the "Road of Iron" is a reminder of the importance of the railroad to Camaguey's past prosperity. The city's development only really took off from 5th April 1846, immediately after the completion of the Nuevitas to Camaguey railway line. The hotel which has a railway theme throughout, & beautiful artworks of renowned artist Martha Jiménez was first opened as a hotel in August 2011. The Camino de Hierro's 45m long roofed balcony is the longest in the province. The original balcony was replaced by an iron-wrought reproduction in the late 19th century. The standard rooms at Hotel Camino de Hierro are clean & well appointed, if a little dull. Inner rooms do not have windows so can get stuffy, though the outer ones are noisier with some first floor balconies overlooking the square. The location of this hotel means that noise is unavoidable, though there are rooms away from the square & the adjacent bar. Standard features include a fridge, air conditioning & satellite TV, while the ensuite bathroom provides complementary toiletries. 이 도시는 옛날 식민지 시절에 아주 중요한 도시였으며, 지금의 이곳은 바로크식의 교회들, Plaza San Juan de Dios와 같은 그리고 멋진 그림들이 구석구석 숨겨져있다. 도시를 둘러보다 보면은 곳곳의 공원과 박물관을 통해 이 도시의 영웅인 인그나시오 마그라몬타에를 느낄수 있을 것이다. 카마과이 시티는 쿠바에서도 가장 아름다운 도시이며, 식민지였던 지난날의 농경산업의 중요지였다. 기차역 근처에는 Ignacio Agramonte의 생가인 박물관을 발견할수도 있다. The La Merced church의 반대쪽을 방문해보라 그 곳에는 벽화와 숭배의 대상이 저장되어져 있다. Plaza San Juan de Dios은 카마가이 시티에서 가장 볼만한 곳이다. 밝은 빛깔의 오래된 자갈로 둘러 쌓여져있으며 예쁜 노란색의 교회를 따라 예전의 병원이 자리잡고있다.